The 12t o Aprile is the 102t day o the year (103t in lowp years) in the Gregorian Calendar, wi 263 days ti come. 1557 - The ceety o Cuenca, Ecuador, is foondit. 1606 - James VI, Keeng o Scots adopts the oreeginal Union Banner as a jynt Banner for Scotland an Ingland, combinin the Saunt Andra's cross o Scotland wi the Saunt George's cross o Ingland. 1861 - The American Ceevil War stairts at Fort Sumter, Sooth Carolina. 1877 - The Unitit Kinrick annexes Transvaal in present-day Sooth Africae. 1927 - The Unitit Kinrick o Great Breetain an Ireland acomes the Unitit Kinrick o Great Breetain an Northren Ireland. 1934 - The highest wind speeds (outside tornadoes or Antarcticae) are measured at Mt. Washington, New Hampshire, Unitit States. 1945 - Preses o the Unitit States Franklin Delano Roosevelt dies agit 63. Harry S. Truman takes ower frae him. 1955 - The poliomyelitis vaccine developed by Jonas Salk is declared safe an effective. 1961 - Yuri Gagarin o the Soviet Union acomes the first human bein tae travel intae space. 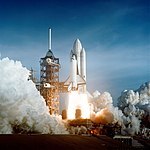 1981 - The Space Shuttle Columbia maks its first flicht. 2003 - In a referendum in Hungary, a majority (83.8%) supports jynin the European Union on a 45.6% turnoot. 2009 - Zimbabwe abandons the Zimbabwean Dollar as its offeecial currency. 2014 - A wildfire in Valparaiso, Chile, kills 16 fowk an displaces 10,000. 2015 - Hillary Clinton propales her intention tae run for Preses o the Unitit States in 2016. Wikimedia Commons haes media relatit tae 12 April. This page wis last eeditit on 16 Apryle 2018, at 15:48.